While it may not feel like fall just yet, the great autumn bird migration has begun. I missed the fall migration last year (not realizing it occurred so early in September) and so this season I have been itching to get out and about and see what I can see. Finding myself with free time over the weekend, I flipped open my North Carolina Birding Trail to find a location I had yet to visit. Lake Crabtree County Park in Morrisville looked like a good birding bet, and was only 20 minutes from my apartment. With a camera, a snack, and a strong urge to see warblers, some of the most colorful neotropical migrants, I set out. 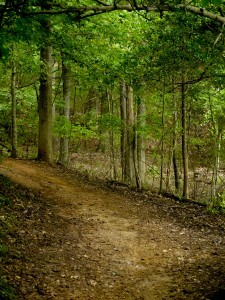 Lake Crabtree County Park has over five miles of trails, including those for mountain bikers. The lake itself is of medium size, and anyone can rent sailboats, paddleboards, and kayaks, though you can’t swim because the water has residual industrial chemicals from old (and not-so-old) industry. A grassy clearing near the parking area provides picnic space and nice views, while the trails wind in and out of the woods at the edge of the water. I ran into the first bird patch within one minute of starting my walk. Warblers often flock with chickadees, and so the second I heard the tittering of the little year-round residents I stopped to look for interspersed migrants. The warblers were zipping back and forth from branch to branch, one moment in full view, the very next obscured by green leaves. I managed to snap a few pictures of a Black-and-white Warbler and a White-eyed Vireo, and then suddenly the flock was gone, moving on to a different canopy area. Excited by my early success, I continued on. Unfortunately for me, the only rainclouds in the Triangle happened to move over Morrisville, and for thirty minutes droplets fell. While the rain was not heavy enough for me to worry about becoming soaked, raindrops shake leaves and cause movement in a similar way birds do. I would see something in my peripheral vision, whirl around with my camera at the ready for a bird, and then see nothing. 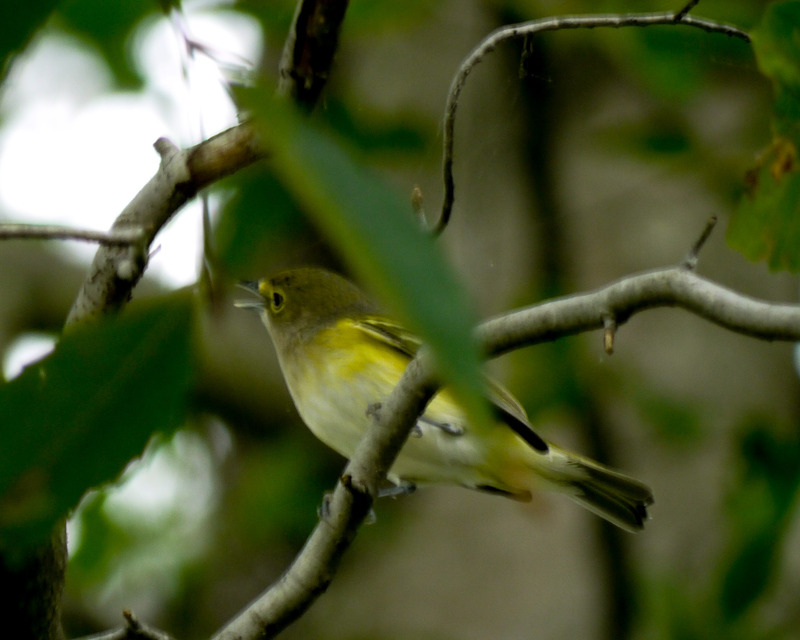 After the rain lifted I had better luck, coming upon another flock of warblers, chickadees, and Tufted Titmice. A few yellow-ish warblers escaped my view, but I had more good looks at the Black-and-White variety. 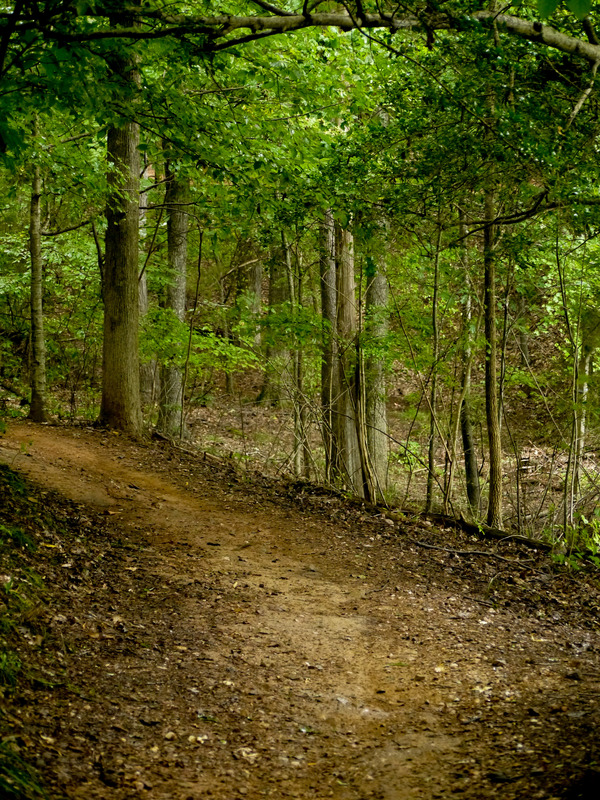 The trail came out of the woods and followed the direct contours of the shore, red with the classic soil of North Carolina. 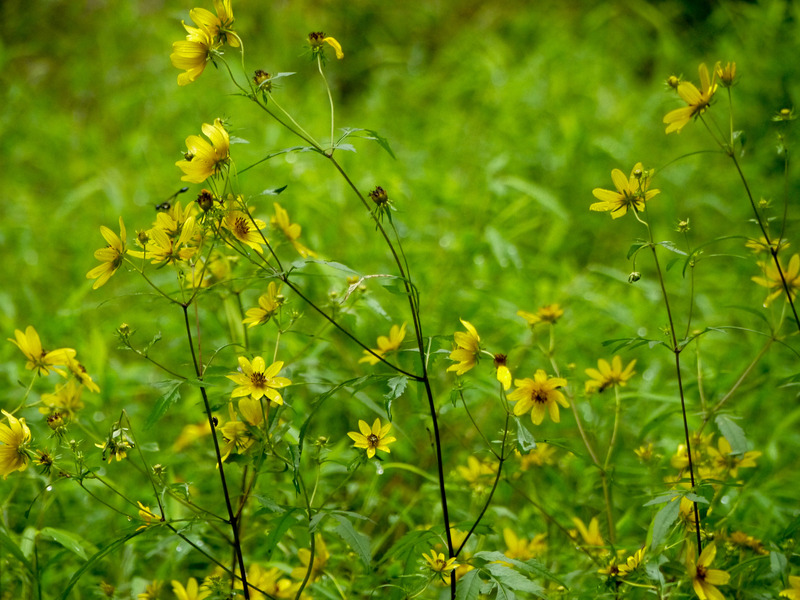 Yellow flowers bordered the trail, as did persimmon trees heavy with fruit. 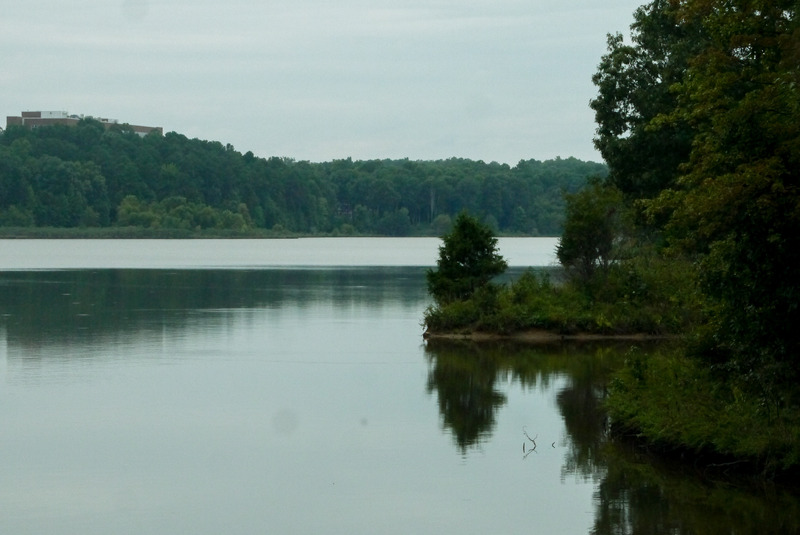 This open section of trail offered sweeping views of the lake, dotted with fishing boats and kayakers. Waterfowl too were plentiful, with many mallards and even geese huddled in a tight group of three. The geese immediately intrigued me. 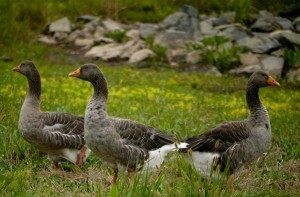 Could they be the Greater-white Fronted Goose, rare in North Carolina and a life bird for me? I furiously clicked photos, trying to get every angle. 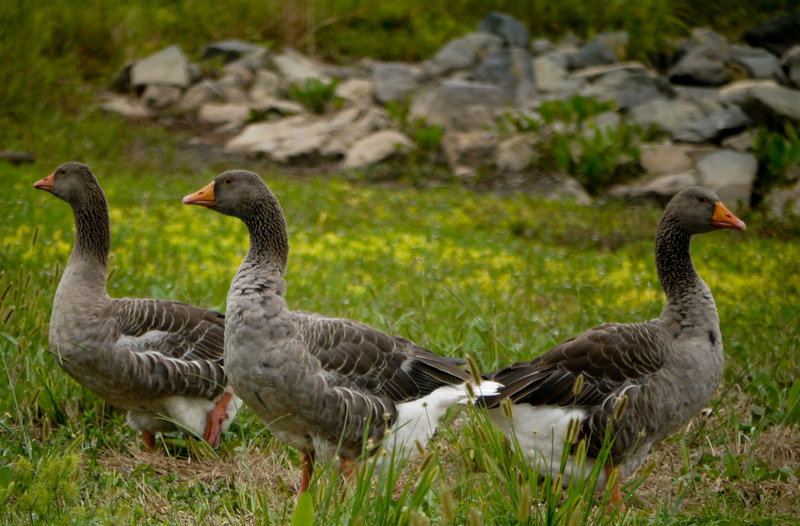 It was only when I looked up the species that I realized Greater-white Fronted Geese are often confused with Greylag Geese, a domestic species common in human-inhabited areas. Well, I was definitely in a human inhabited area, and comparing my photos against the online samples I knew I was looking at a domestic species. Oh well, they were still interesting! As I headed back to the parking area, I heard few birds. Perhaps the rain had caused them to seek shelter, and it was not late enough in the day for them to begin their evening feeding frenzy. Since I was not distracted by the songbirds, I turned my attention to the lake itself. In addition to waterfowl, Double-crested Cormorants were plentiful on the lake, and as I re-approached the boat launch I discovered a tall deciduous tree just full of squawking cormorants. I always find it odd when sea or waterbirds sit in trees, like they are defying nature. 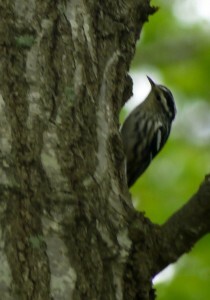 They were fun to photograph though, and unlike the warblers they stayed still. I have had my first taste of the fall migration season. Even though school is busy, I will make sure to get out a few more times before the warblers and other migrators disappear until next spring. Time is short, but the satisfaction of adding warblers to my birding life list is long!